Almost a year ago, Streetsblog announced that a team of UCLA Graduate Students were working on a “Transit Photo Project” where participants took pictures of their transit oriented commute. These photographs would create photologs of their commuting experience and would allow the researchers to analyze how participants really feel about their commutes. 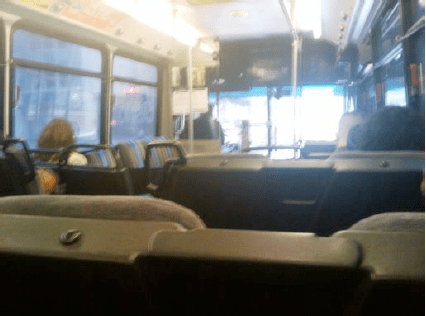 Description: The bus is usually pretty empty…and I pretty much know everyone who rides it…at least I know their faces. Some of the riders know each other and have conversations on the ride in to work. A lot of admin assistants at law firms in Century City ride this bus (they pick it up at Union Station — I think most of them ride in on the Metrolink)…their chatter reminds me of riding the subway in NYC when I lived there…you always got juicy office gossip about an office you have no connection to. If you have some time to read through the findings, or just preview the pictures and captions put together by the participants, take advantage of what Brian Taylor and Camille Fink have put together at the website. It’s worth a look. The Secrets of Successful Transit Projects — Revealed!